Background: Cancer cells are described as an unregulated growth and spread of abnormal cells. Recently, cancer has become the most important major reason for deaths in the world. Methods: For anticancer activity, we have used the MTT method and determine the early/late apoptosis by flow cytometry. Results: The title compounds were procured by reacting 2-chloro-N-[4-(pyridin-4-yl)thiazol-2- yl]acetamide with some substituted piperazine derivatives. The in vitro anticancer activity of synthesized compounds was tested against C6 rat glioma cells and A549 human lung carcinoma cells. 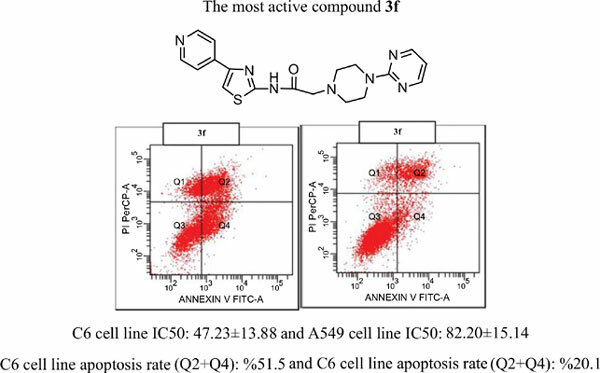 As a result, the compounds 3d, 3e, 3f and 3g have shown anticancer activity against both cell line. Conclusion: Specifically, compound 3f was determined as the most active compound against C6 rat glioma cells. Also, as understood, the core structure which is substituted with piperazine bridge, the heterocyclic aromatic derivatives are more active than phenyl or benzyl derivatives. Thiazole, azole, piperazine, acetamide, anticancer activity, phenyl, benzyl.